The United Nations is an intergovernmental organisation that was established after World War II to promote international co-operation and prevent another such catastrophe. Even before the trials of the Cold War there was much to deal with, not least the Arab-Israeli conflict. Tensions had existed in Palestine for many years and the British were formally awarded the mandate to govern the region in 1922, a situation that caused a number of rebellions amongst the Arab Palestinians. After the war and the Holocaust, the British Government announced its desire to terminate the Mandate, and the United Nations General Assembly adopted a resolution recommending partition of Palestine into an Arab state, a Jewish state and a Special International Regime for the City of Jerusalem. The Jewish leadership accepted the proposal, but the Arabs rejected it and started a civil war in 1948. A combined invasion by Egypt, Jordan and Syria, together with expeditionary forces from Iraq, entered Palestine. They took control of the Arab areas and immediately attacked Israeli forces and several Jewish settlements. The war ended in an Israeli victory and the establishment of the State of Israel. Ralph Bunche was an assistant to the United Nations Special Committee on Palestine, the chief aide to Sweden’s Count Folke Bernadotte, who had been appointed by the UN to mediate the conflict. Bernadotte however, was assassinated by members of the underground Jewish Lehi group . Following the assassination, Bunche became the UN’s chief mediator. This was obviously going to be a tricky task requiring a specialised set of skills. Librans generally make good diplomats because they can see each side of a situation equally, Gemini would be useful for communication skills but also anyone in this delicate position would need a strong sense of themselves to avoid being compromised by one party or another, so perhaps some Leo would come in handy. Fortunately, Ralph Bunche had all of these qualities, Ascendant in Libra, Moon in Gemini and Sun in Leo. His Sun was in the 11th house of politics and was very closely opposite Saturn, showing the degree of difficulty of his role. Bunche’s Moon in Gemini was in exact conjunction to Pluto and opposite Uranus revealing the explosiveness of the situation. The Moon was in the 9th house of foreign affairs. The representative for Israel was Moshe Dayan. Dayan’s Sun was at 13 degrees Taurus creating a challenging T Square to Bunche’s Sun / Saturn opposition. Dayan reported in his memoirs that much of this delicate negotiation with Bunche was conducted over a pool table, a very Leonine way to do diplomacy. Bunche commissioned a local potter to make plates bearing the name of each negotiator. When the agreement was signed, Bunche awarded these gifts. After unwrapping his, Dayan asked Bunche what might have happened if no agreement had been reached. “I’d have broken the plates over your damn heads,” Bunche answered. For achieving the 1949 Armistice Agreements, Ralphe Bunche received the Nobel Peace Prize in 1950, he was the first African American and person of colour to be so honoured in the history of the prize. The whole episode occurred on Pluto’s watch as it was conjunct Bunche’s Sun from 1948 – 50. Intriguingly Pluto had also been square to Dayan’s Sun in 1948 and his role in the Arab – Israeli war and the peace negotiations that followed was a major turning point in his life as well. 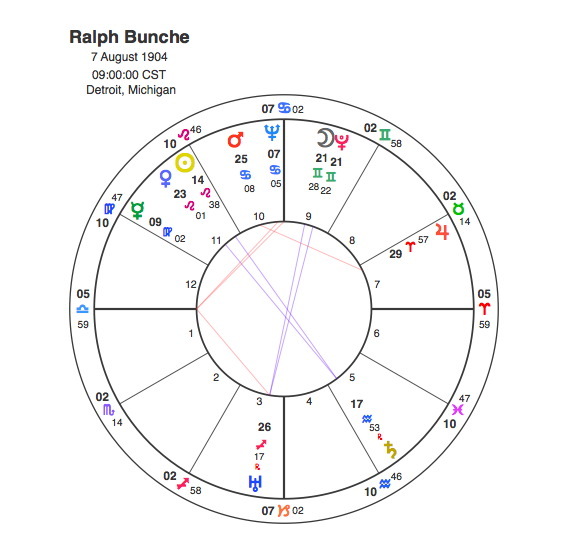 Ralph Bunche continued to work for the UN, mediating in other strife-torn regions, and was rewarded for his efforts when he was appointed as Undersecretary-General in 1968 with Pluto in square to his Moon. The diplomatic game requires a complex skill set, fortunately with Leo, Gemini and Libra strong, Ralph Bunche had the whole package and with Pluto’s help aided the end of that Arab – Israeli conflict and the establishment of the state of Israel.